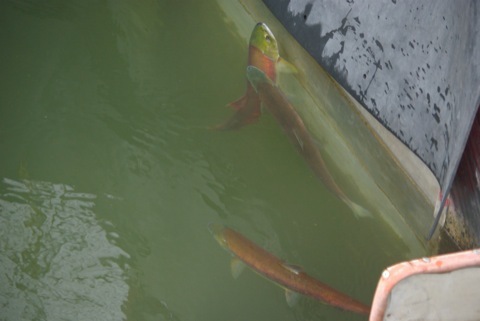 As of 7/13/09 914 sockeye salmon have crossed Lower Granite Dam. Last year was a record for modern times when 909 Sockeye Salmon passed over Lower Granite Dam and 450 plus 650 returned to the Sawtooth Valley. This year there have been 914 so far and the run is not over. There was a year when only one male made the 900-mile journey. He was dubbed Lonesome Larry. In 1990 there were none. “Between 1991 and 1998, only 16 wild sockeye salmon returned to Idaho. All of these adults were incorporated into the captive breeding program and spawned at the Eagle Fish Hatchery. The program releases eggs and fish back to the habitat in a variety of ways. Eyed-eggs are planted in egg boxes and placed in lakes in the fall, presmolts are released directly to lakes in the fall, smolts are released to outlet streams in the spring, and prespawn adults are released to lakes in the fall. A monitoring and evaluation effort is in place to document the success of the different reintroduction strategies. It is amazing the hurdles that have to be jumped to save the Idaho sockeye. Wouldn’t it be nice just to have the fish swim up the river and do it themselves instead of having to go through the machinations that this “program” has to have in place due to the salmon-killing effects of the lower four Snake river dams? Hopefully this administration will decide to do the right thing and breach those four dams. Now lets get some of these fish established in Stanley Lake and the other lakes in the Sawtooth Valley. I stopped a few years ago at Babine Lake in British Columbia during the sockeye run and it was overwhelming. The stream flowing into the lake and two artificial spawning channels along each side of the stream were packed with red fish. When I asked how many sockeye there were, I was told it was a small run, “Only a million sockeye returned this year.” The major difference between Babine Lake and Redfish Lake, other than size, is that there are NO dams between Babine Lake and the ocean and EIGHT dams between Redfish Lake and the ocean. The four Snake River Dams need to go. My understanding is that part of the fishing season the IDFG has opened up in a portion of this area conflicts with the survival of any possible returning sockeye. ” How can the Idaho Department of Fish and Game authorize any fishing for Chinook salmon that would potentially result in the take of sockeye salmon ? At a minimum no authorization of a IDFG bag limit for Chinook salmon less than 24 inches should be allowed considering the possibility of confusing smaller hatchery Chinook with hatchery sockeye. The Idaho Department of Fish and Game salmon season rules provide no visual clues for differentiating sockeye salmon from Chinook jacks or smaller Chinook so people fishing have no idea what they may be catching. Please explain how this probable take of sockeye salmon is being permitted and why”. Last year there were 909 sockeye over the last dam, but only 450 made it back to the Sawtooth Hatchery. Where did the other 459 fish that made it over the last dam go? It would seem that after being fit enough to get over 8 dams, that a larger percentage of sockeye should make it to the Sawtooth area. Did they take a wrong turn and end up below Hells Canyon Dam trying to get up the Snake River, or did fishermen mistake them for other species and keep them as kt suggests might happen. If we are really serious about restoring the sockeye to Redfish, shouldn’t they be trapped at the last dam and trucked to Redfish? That would double the number of spawning adult sockeye each season and help jumpstart the program. Larry, kt may be right for a certain percentage but you are only talking about 50% mortality from the dam to the hatchery. Considering the number of miles to travel between those two points, that does not seem like an unreasonable number to lose to predation, confusion, etc. I would like to know what similar mortality numbers were in the past before I blamed it all on the anglers. But I would be 100% for greater angler education for knowing the species (chinook versus sockeye) as well as fishing closures on the river during the key migration time. I talked to a IDFG fisheries biologist this spring, who works on salmon recovery in the Sawtooth area. He told me that some of the returning Sockeye are really kokanee (land- locked sockeye) from Redfish Lake, that made the trip to the pacific and back. He said they get just as large as the regular sockeye when they do this. If this can happen, are juvenile kokanee from Payette Lake near McCall, and from Anderson Ranch, Lucky Peak, and Arrowrock reservoirs on the Boise River, migrating out to the ocean via the Snake River and unable to return as adults past Hells Canyon Dam? Is anyone looking for those lost 459 (last year) or (more this year),sockeye (kokanee) in the Snake River right below Hells Canyon Dam? Jdubya and Larry, I am all for natural restoration, but can they afford to close those dams? Are they a major power source? I am not familiar with the area. Yes, the 4 lower snake dams could definately go as should hells canyon dam and the dams above it. (atleast add fish passage at a minimum. The four lower Snake River dams in Washington, were put in primarily to make Lewiston, Idaho a seaport. They are a system of locks and reservoirs to allow sea going ships to get to Lewiston. Potlatch Lumber and Paper in Lewiston was one of the main beneficiaries of this system, but I think they quit shipping by barg a few years ago. The dams provide subsidized shipping for some grain farmers in Washington and produce some power. They provide no flood control. The first of the four constructed I think was Ice Harbor. Ice Harbor was famous because it killed 90 percent of the juvenile salmon going down stream through it when it was built. ONE dam killed 90 percent. The fish ladders were so poorly designed that it took each adult salmon an average of more than 30 days to find its’ way over Ice Harbor. They don’t have 30 days to spend at one dam. These four dams have been a disaster for Idaho Salmon of all species. They should have never been built. These are not the Hells Canyon series of dams farther upstream, on the Snake between Idaho and Oregon. That is another story, just as sad. The way I see it, the benefits of the dams are enjoyed by a few farmers and electricity rate payers. Meanwhile, the rest of us are paying with the decline of the salmon runs. If the dams’ beneficiaries had to pay us for the lost salmon, I’m sure they’d agree that taking the dams out was more economic. Good summary Larry! One of the big problems with these four dams is that make up almost a continuous slackwater from the tail of the first fourth lake to the dam of the first, and that raises the temperatures, lowers oxygen content (which encourages and is facilitated by algal blooms) and allows for non-native predatory fish to much on he bewildered smolts as they head down river. One comment in that article was interesting, that they thought the increased numbers were due to better ocean conditions. Does not that statement fly in the face of the abrupt decline in salmon numbers in Calif, Oregon and Washington which “experts” have also said was due to poor ocean conditions? How can “ocean conditions” be good for sockeye but bad for chinook? Just puzzled. To answer the question you have about the fish that don’t make it to the Stanley Basin I would repeat what I’ve been told with regard to the same question although there weren’t the same number of fish returning over the dams at the time. I’ve been told that some of those fish might be kokanee from Dworshak Reservoir that return but I’m not sure that would apply to these. The fish returning this year are likely fish that did migrate all the way to ocean but some kokanee spend their lives in the reservoirs on the main river then return. I know that some of these fish also stray. A friend of mine who was doing spawning ground surveys found one in Big Creek in Central Idaho about 8 years ago and I’ve heard of others. I’m not sure if there is just low survival between the dams and the Stanley Basin, straying, or if they simply aren’t fish from the Stanley Basin to begin with. I’m not sure that trucking them would be a great idea especially if the fish aren’t from Stanley. The only way to tell is by tagging them and we all know what your feelings are about that. I like the dam removal idea better. As far as the reasons for not returning them to Stanley Lake, bacterial kidney disease and lake trout are the main ones. BKD is present in the lake and lake trout would love the extra meals. The species use different areas in the ocean, the Inshore feed has been good the last few years which has been a boon for Sockeye, Silvers, and steelhead, but the offshore has been lacking which has been bad for chinooks. That can be noted by large Jack counts for chinooks (the jacks stay close) but poor adult returns. Thanks Ryan, that makes sense. There is a book I read that was put out a few years ago, that I found interesting about the dams on the lower snake, it is called Controversy, Conflict and Compromise, A History of the Lower Snake River Development. By Keith C. Peterson and Mary E. Reed it was prepared for the Walla Walla District of the Army Corps of Engineers..Published in 1994..
Chinook and sockeye have entirely different diets. Sockeye are planktivores and chinook eat larger prey. That accounts for their different survival rates. Salmon runs are very complicated. I noticed this morning while looking at the Fish Passage Center data that the run of sockeye returning to the upper Columbia is about half of last year’s run while the Snake River fish are returning at about the same level as last year. What accounts for the difference? That is the big question and some will argue that it is just ocean conditions but others will argue that it is Judge Redden’s pressure on the dam operators to spill water at the Lower Snake Dams. On a side note, pink salmon have different diets too and they only return every other year. In the southern part of their range they return in odd number years and in the northern even. It is theorized that due to the large number of fish their prey is reduced to such low levels that it takes two years for their prey to recover. Also, pink salmon only live 2 years. There is one exception to the 2 year rule and that is in the Great Lakes where 3-year old fish have been observed. They are not native to the Great Lakes though. I have caught pinooks there too, pink X chinook hybrids which occur naturally there but not in the Pacific to my knowledge. Survival can also be determined by which part of the ocean a certain species utilizes. I’ve heard that in some years the ocean conditions favor Alaska fish over more southern runs and vice versa. It might be true for Columbia River fish and California fish as well. In fact it could differently affect runs of the same species from the same river like spring, summer, and fall chinook. There are now 1013 sockeye over Lower Granite Dam. I am not opposed to all tagging, just those that I think do more harm than good, and those that go on forever after a species has been recovered. I think that Idaho Sockeye may already get a pit tag and probably are fin clipped as well, so it shouldn’t be hard to identify them. It would be interesting to see how many Idaho Sockeye end up being caught by commercial and tribal fishermen using gill nets on the lower Columbia. Did I read in the report that they catch 10,000 sockeye? Those endangered Redfish Sockeye Spawners are far too valuable to end up as fillets. It would be great in out lifetime to see those dams go as well as salmon and steelhead return to the Malheur river and its drainiages. chinook have a black gumline and black spots. There are enough surplus hatchery chinook that the surplus fish are being trucked down river to give anglers another shot at them. Incidental catch of endangered fish is considered by IDFG and FWS prior to setting season dates. The upper Salmon stretch will be closed down to chinook salmon after this weekend. Salmon fishing in Idaho, while being combat fishing, is a riot. Reading an article in the Idaho Statesman today I noticed that there were 650 rather than 450 that made it to the Sawtooths last year. I couldn’t find the numbers when I looked but must have remembered the number from the board at the hatchery where I took the photo. BTW there are now 1118 over Lower Granite. Using the same conversion that would amount to 765 fish back to the Sawtooths. I don’t think it is ridiculous to think that these dams, which are not economically viable, will eventually be breached. I personally think that it is the only rational decision left for salmon recovery in Idaho and there has been a lot of recent discussion from unexpected sources who are open to the possibility. I also take issue with your characterization that dams “are exceptionally clean, green and consistent sources of energy”. I don’t see that the cumulative effect of killing such a large number of migrating juvenile salmon is very clean or green. Pollution can come in many forms and high temperature is one of those. These dams “pollute” the water with high temperatures making the reservoirs unsuitable for salmon and steelhead migration during the hot period between mid July and late August. If you read the passage correctly you will see that he is referring to a period in the past not the present. I am not aware of what percentage of migrating juveniles Ice Harbor kills but at the time of construction there was no effective juvenile bypass system on any of the dams and it is quite possible that 90% of the juveniles were killed. Each dam kills a percentage of the juvenile fish and cumulative impacts to a specific run can be severe. If the percentage is 5% at each dam then, starting with 100 fish the first would kill 5% leaving 95 until you reached the last of 8 dams where you would be left with only 70 and of those 70 many would be in a severely weakened state meaning they would be easy prey below the dams. If the rate is 10% then you would be left with only 48 of those 100 fish below the lowest dam and those fish would be in an even weaker state. As it turns out, according to the 2004 NOAA biop nearly, 92% of the fish are killed as they pass through the 8 dams so the rate appears to average 30% at each dam. I don’t know what those numbers are from year to year but I think you can get the picture.